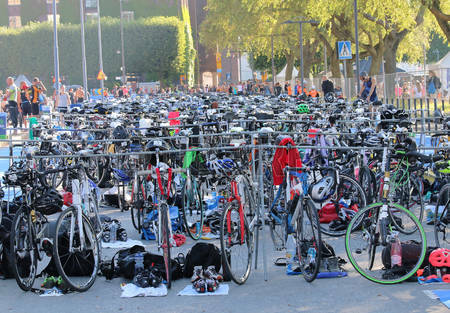 Training for a triathlon is tough and after all your hard training hours, the last place you’d want to lose time is your transitions on race day, which is why we’ve provided a guide to help make your transitions a breeze on the big day. It’s easy to lose your bike in the sea of other bicycles, but don’t stress the small stuff. The easiest way to spot your bike on race day is to tie a balloon to your bike, sure it’s a little cheesy, but you’ll be able to spot it in no time after racing out of the water. If a balloon isn’t your style, try a bright neon color towel of your choosing and place it on the seat of your bike, not as in your face, but still easily noticeable. Lastly, walk from the swim exit to your bike and count bike racks to create a mind map for where your bike is located. Do this a couple of times if necessary. It’s best to wear an outfit (i.e. 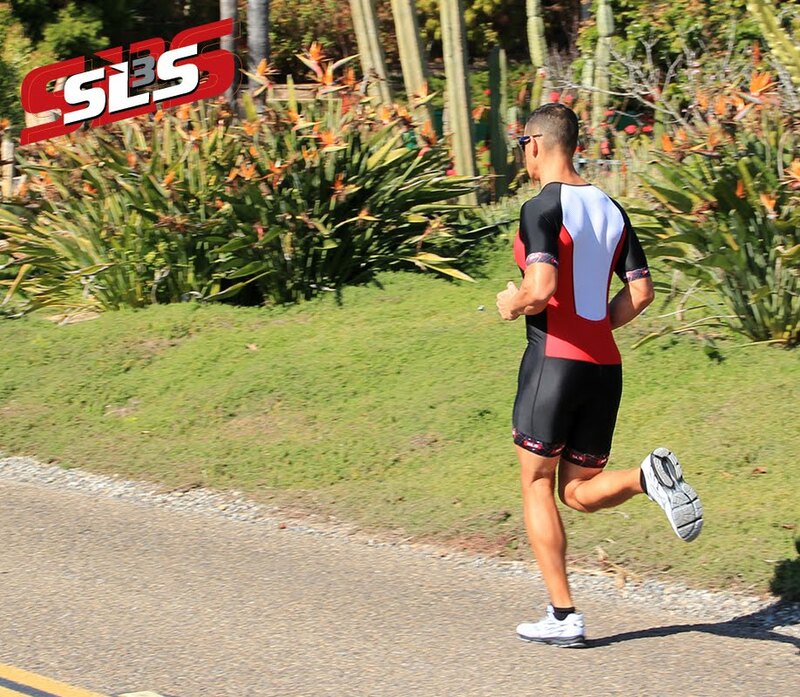 Triathlon shorts, Triathlon Suit) that can fit smoothly underneath your wetsuit, so you don’t have to change in the bike area and your outfit is on right when you take off your wetsuit. To make putting on your gear easier, leave your helmet face up on your bike seat, so that your sunglasses can fit in your helmet. At some races, you’ll see people bring buckets of dish soap and water next to their bikes; we recommend you skip this step unless the water portion takes place in the ocean. If you just ran on the beach to get to your bike, dunking your feet in the soap water will quickly get off the stubborn sand, otherwise the bucket is just another thing to eat up time and valuable space. Once you are ready to start the bike portion of your race, you might want to rethink mounting your bike. A huge time saver is to have your bike shoes already clipped onto the bike and then run with your bike to the mount line and hop on. If the mount line is on a hill or immediately going to go into a hill, mount your bike at the top of the hill. Practice safely running with your bike and putting your feet in the shoes while you are pedaling on the bike before race day to avoid injuries. Leave your bike in an easy gear so you don’t have to pedal as hard in the beginning. If you followed our tip above by having your bike shoes already attached, the easier gear will also make the bike more stable when putting on your shoes, plus it’s a good warm up. The speed lives in the transition from biking to running. Have your hat with sunglasses in it, you might want to change from your biking ones, sunscreen and race belt. Put on the sunscreen and go. The other gear can be put on while you run. It’s faster to put your hat and belt on while running then it is standing still. As the saying goes the more you practice the closer to perfection you will be. It may take a few races to find out what really works for you. Practice your swim to bike transitions and then practice your bike to run transitions during training. It’s best to know how you will transition before the clock is ticking, so adding a day or two of transition practice to your training schedule will not only help with the transition portion, but also help your body get used to switching from swimming to biking and biking to running. 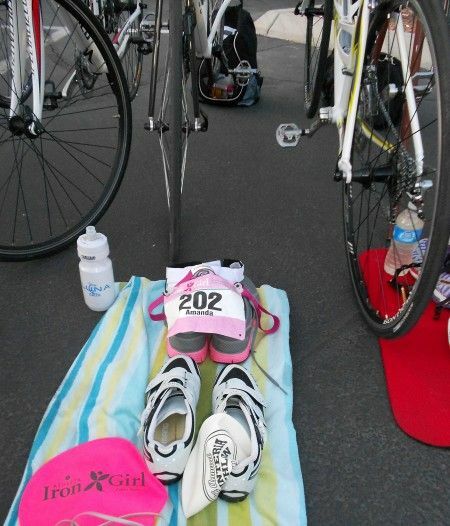 Lastly, envision how your set up will be on race day and how you will transition. Running your transitions through your head before your race will help you remember the fastest steps and help you remind yourself what you need on race day.